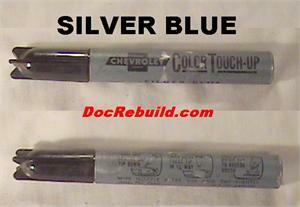 1958 Corvette Silver Blue Vintage GM Touch-Up Paint Stick Genuine GM Chevrolet Color Touch-Up in a metal tube with plastic cap. CAVEAT EMPTOR: The flutes on the Art Deco style cap echo the Jet aircraft mimicry found in 50's GM iron. These are about 4 1/2" long and 1/2" in diameter. The back side shows the method of application. 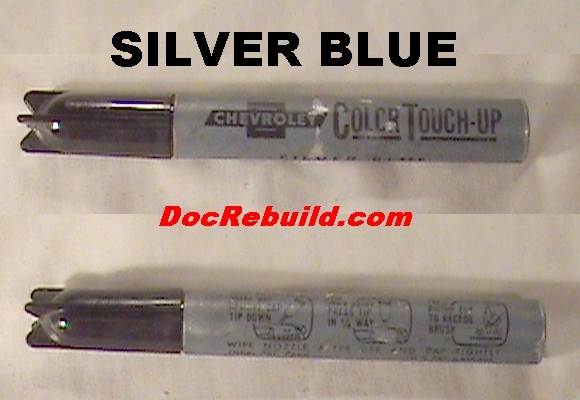 "Remove Cap, Tip Down" then "Press Tip in 1/4" the "Tap Bottom to Recede Brush". Guaranteed not to spill or drip as this paint is dried out! The only use it has is as a display in your package tray, glove box or pocket. Shows typical shelf wear from 5 decades. NOTE: attempting to remove cap will probably break the plastic cap. Do so at your own risk.